After the successful theatrical run of their documentary, Turn It Around: The Story of East Bay Punk, Green Day and 1-2-3-4 Go! Records are set to release a Blu-ray/DVD combo pack and soundtrack of the film on June 22nd. Soundtrack will be available as a double vinyl and double cassette. No CD soundtrack or digital companion were listed on the press release. Narrated by Iggy Pop, Turn It Around: The Story of East Bay Punk features Grammy Award-winning Green Day front man Billie Joe Armstrong, Grammy Award-winning Metallica lead guitarist Kirk Hammett, Grammy Award-winning producer and Rancid front man Tim Armstrong, Kathleen Hanna, Miranda July, Disposable Heroes of Hiphoprisy and Spearhead front man Michael Franti, Minor Threat and Fugazi’s Ian Mackaye and over 100 more interviews with artists and musicians from California’s East Bay punk music scene. 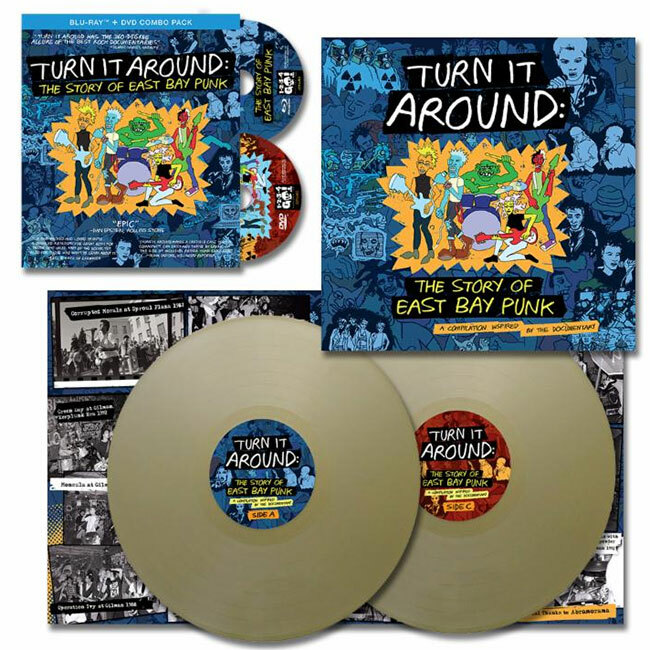 Executive produced by Green Day, Turn It Around: The Story of East Bay Punk spans over 30 years of the California Bay Area’s punk music history with a central focus on the emergence of Berkeley’s inspiring 924 Gilman Street music collective. The documentary, which Rolling Stone named one of the “best music docs of 2017,” made its world premiere as the opening night film of 2017’s 16th SF DocFest, followed by an initial two-week sold-out theatrical run at the Alamo Drafthouse Cinema in San Francisco. The hometown opening was followed by many sold out screenings in over 100 theaters in cities across USA and Canada in tandem with Green Day’s Revolution Radio World Tour, with the theatrical campaign launching with a three-week run at IFC Center in New York City and culminating in Los Angeles for one night only on three sold-out screens at the ArcLight Hollywood. Along with it being an Official Selection at the 2017 SF DocFest, the documentary was also part of the 2017 Calgary International Film Festival and the 2018 Albany FilmFest. Turn It Around: The Story of East Bay Punk features the full-length theatrical cut of the film (2 hours and 37 minutes), five deleted scenes and more. The soundtrack is a sprawling collector’s edition compilation featuring the opening and closing credits songs from the documentary and 35 mostly rare, unreleased and/or out-of-print tracks from bands like Green Day, Rancid, Neurosis, Operation Ivy, Jawbreaker, Pinhead Gunpowder, and many more. Proceeds from the soundtrack go to the Women’s Daytime Drop In Center, a non-profit program in Berkeley, CA, empowering women and children to move from the streets to a home by providing ongoing and intensive counseling, case management services, daily support groups, a comprehensive children’s program, a variety of referral services, and a transitional housing program for four single parent families.